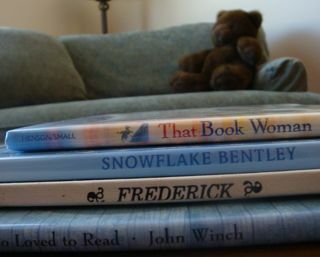 That Book Woman by Heather Henson Inspired by the pack horse librarian project from WPA times, the dedicated heroine of this books wins over even the Appalachian boy not "born to sit so stoney still a-staring at some chicken scratch." Snowflake Bentley by Jacqueline Briggs Martin "Neighbors laughed at the idea of photographing snow" but Wilson Bentley was part scientist and part artist, with a passion for nature. Wonderful woodcuts by Mary Azarian. Frederick, one of Leo Lionni's Little Mice Tales Boxed Set One of my favorites to read with my own children, this book is hard to find, so grab one if you locate a copy. Frederick is the loner who doesn't join others in preparations for winter -- but finds a unique way to serve his fellow mice when the cold comes. The Old Woman Who Loved to Read by John Winch An old lady moves to the country to have time for her books, but alas... When I was a school librarian people would always be envious of a job with "all that time to read" so this book is close to my heart. Gorgeous artwork, lots of animals for the pre-school to second grade set -- and an Australian setting.